Masshole Sports: Yesterday, Dennis Rodman Did A Bizarre Interview While Wearing A Red Sox Hat And Drake Posted A Picture On Instagram With A Red Sox Logo Behind Him. What A Sucky Day For The Red Sox. Yesterday, Dennis Rodman Did A Bizarre Interview While Wearing A Red Sox Hat And Drake Posted A Picture On Instagram With A Red Sox Logo Behind Him. What A Sucky Day For The Red Sox. 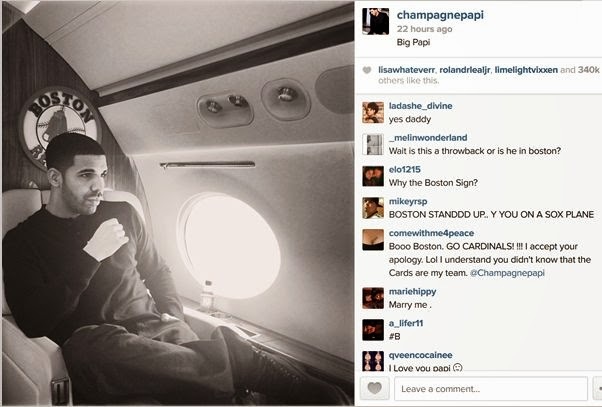 Later in the day, Drake posted a picture of himself on Instagram with a Red Sox logo prominently displayed right behind him with the caption "big papi:"
Sure, his song "Started From The Bottom" was played in the Red Sox clubhouse after each series they clinched, but the dude is a fraud. I guarantee if the Yankees had won the World Series, that would be a Yankees logo behind him. I honestly have no idea how to feel about this. I mean, Im happy they are reigning World Series champions but it is painful to see freaks and phonies associating themselves with the Red Sox. But I guess its good thing, from a marketing perspective, that the Red Sox are relevant in the mainstream....I guess?